(Nanowerk News) How do you make an optical fiber transmit light only one way? Researchers from the University of Illinois at Urbana-Champaign have experimentally demonstrated, for the first time, the phenomenon of Brillouin Scattering Induced Transparency (BSIT), which can be used to slow down, speed up, and block light in an optical waveguide. The BSIT phenomenon permits light to travel in the forward direction while light traveling in the backward direction is strongly absorbed. This non-reciprocal behavior is essential for building isolators and circulators that are indispensible tools in an optical designer's toolkit. In this study, the researchers demonstrated the BSIT phenomenon using nothing more complicated than a glass micro-fiber and a glass sphere adjacent to it. 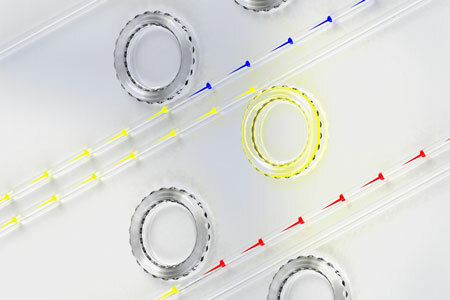 "Light at certain wavelengths can be absorbed out of a thin optical waveguide by a microresonator--which is essentially a tiny glass sphere--when they are brought very close," explained Gaurav Bahl, an assistant professor of mechanical science and engineering at Illinois. "Through the BSIT phenomenon we can eliminate this opacity, i.e., we can make this system transparent again by adding another laser at a specially chosen wavelength nearby. "The effect occurs due to the interaction of the light with sound waves present in the material, and is a new physical process that has never been seen before. The most significant aspect of our discovery is the observation that BSIT is a non-reciprocal phenomenon--the transparency is only generated one way. In the other direction, the system still absorbs light." Time-reversal symmetry (i.e. reciprocity) is a fundamental tenet understood in most acoustic, electromagnetic, and thermodynamic contexts. Engineers are often forced to use tricks to break this time-reversal symmetry for specific device applications. Current non-reciprocal optical devices--for example, isolators and circulators--are exclusively built using the Faraday magneto-optic effect. This method uses magnetic fields to break the time-reversal symmetry with certain specialized garnet and ferrite materials. However, these materials are challenging to obtain at the chip-scale through conventional foundry processes. Magnetic fields are also sources of interference in many applications such as cold atom microsystems. These constraints have deterred availability of Faraday effect isolators for on-chip optical systems till date. "We have demonstrated a method of obtaining linear optical non-reciprocity that requires no magnets, can be implemented in any common optical material system without needing ferrites, and could be implemented today in any commercial optical foundry," Bahl added. "Brillouin isolators do already exist, but they are nonlinear devices requiring filtering of the scattered light. BSIT, on the other hand, is a linear non-reciprocal mechanism." "Brillouin-Mandelstam scattering, originally discovered in the early 1920s, is the coupling of light waves and sound waves through electrostrictive optical forces and acousto-optic scattering. It is the fundamental physical process behind BSIT, and occurs in all solids, liquids, gases, and even plasmas," stated JunHwan Kim, a graduate student at Illinois and first author of the paper, "Non-Reciprocal Brillouin Scattering Induced Transparency", appearing in the journal, Nature Physics. BSIT also enables the speeding up and slowing down of the group velocity of light. Physicists call this "fast" and "slow" light. "Slow" light techniques are extremely useful for quantum information storage and optical buffer applications. Some day, such buffers could be incorporated in quantum computers. "While it is already known that the slow and fast light can be obtained using Brillouin scattering, our device is far smaller and uses far less power than any other previous demonstration, by several orders-of-magnitude. However, we must sacrifice bandwidth to obtain such performance," Kim added. In their studies, Bahl's research group uses the extremely minute forces exerted by light to generate and control mechanical vibrations of microscale and nanoscale devices--a field called optomechanics. In resonant microcavities, these miniscule forces can be enhanced by many orders of magnitude. They are using these phenomena to unearth new physics behind how solids, liquids, and gases interact with light.